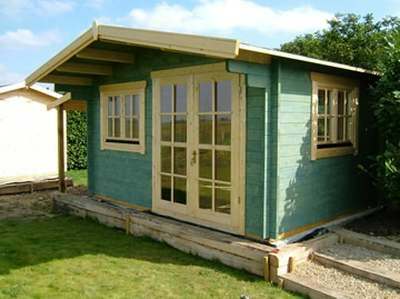 For many, log cabin summerhouses provide the ultimate way to really enjoy your garden in comfort and style! For many people, a damper climate or cold temperatures mean the time spent enjoying their garden is curtailed significantly. A well located summerhouse can soak up the sun rays and provide a cosy environment for admiring your garden. Summerhouses also provide a place to keep a few chairs and things, which are handy for enjoying your garden, even in the better times of year. Best of all they are a place to relax and unwind and just enjoy the beauty nature has to offer! Which aspects of log cabin summerhouses should you look at? The logs are critical in any log building, as we have mentioned many times before. Even though log cabin summerhouses may generally be smaller and less expensive than other types of log cabins, you still should look for quality. Whilst you may not need the ultimate logs, it still pays for you to know what to look for, if you want something which will last well. Of course maintenance plays an important role in this too, but inherent wood characteristics are still key too. Discover more about logs themselves in our log section. One the most important considerations for log cabin summerhouses is their location and which way they face. Of course you want the best possible view from it, but also you should think about maximizing the sun’s warmth (especially if you plan for no heating). You will also need to think about surrounding vegetation and buildings. These may block out natural light from your summerhouse and also may spoil the view. If your garden is sloping, having a raised position can also be good. Not only is your view out maximized but also it is likely to be a drier spot, away from possible wet areas which could affect the logs in the long term. One other thing to bear in mind is always leave enough room to allow access for painting the logs externally in the future. In this respect also try to resist growing plants up the logs, as this will hinder future maintenance and may cause deterioration of the logs. 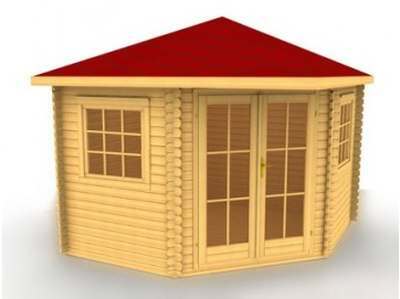 The site you choose for log cabin summerhouses may dictate the shape of cabin you go for. For example a corner plot may well suit a corner style unit with a 45 degree frontage, to give the best outlook (see picture below). Basic rectangles or squares tend to be the most cost effective in cost per square meter or foot terms, but a location in the middle of a straight edge would probably suit this design best. Most people enjoy sitting inside their cabin and looking out, so ensure the design lends itself to this (with doors closed or open). Pay attention to what you intend to use in your summerhouse and make sure you have enough room. If you think you will use it a lot, think about where you might store things too. The view out from inside log cabin summerhouses is crucial, especially if you plan to use it a lot in cooler times of the year. The number, size and location of all the windows and doors therefore, is extremely important. Not only this, but the actual glazed area of the doors, will also have a considerable impact overall on the view out. Try to find the design you like and recreate where you might sit inside and what sort of a view this would give of your garden. Remember although larger windows may be more costly, if the glass is lower your view out will improve. Natural light is a big plus, but you must weight up the cost and think about any furniture you may want, as you probably wouldn’t want it to be in front of a lot of glass. The quality of the glazing is also important as good double glazing would obviously provide much better insulation than thin, single glazing. Consider whether all the windows need to open or not. Fixed units are normally cheaper, but if you want the option to open for cooling, or just to provide a bit of fresh air, then make sure you get this type of window. Make sure there are no obstructions nearby which may interfere with opening the windows and doors fully. The colour you paint your summerhouse will be important. After all most summerhouses can be seen from the main house and therefore you will spend quite a bit of time looking at it. Do you want something which blends into the garden space, or do you want to make a statement and have something that stands out? Natural colours are always a good choice as they will complement most gardens. You can always change your colour in the future when you come to repaint it, but remember it is much easier to go darker than it is to try and go lighter. The colour underneath will affect the final result if you paint over using a semi-transparent type of wood stain. If you want to dramatically alter the colour an opaque wood stain may be the best way to go, but remember you will not see the natural wood grain through this type of stain. A much overlooked area, but something which is critical to the long term success of log cabin summerhouses! Too often I have seen a garden cabin put right next to the damp soil and the resultant wood rot which had occurred over the year. Always try to keep your logs away from any sources of damp! While you may save cost not putting in some form of proper base and keeping your logs well away from the ground, it is false economy in the long run. 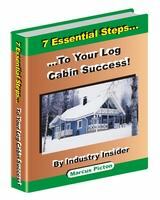 Find out more about different types of log cabin foundations. For many people a summerhouse is a place of contemplation and rest. A well designed, built and located summerhouse will generally offer what most people need, without having to go to the expense of putting electrics in for lighting and heating. However if you plan to use your cabin for work, or maybe want the option to be there for long periods of use in the middle of winter, then having electrics may be great move. Think carefully about what you intend to use your summerhouse for and plan accordingly. Although putting electricity in is not cheap, if it allows you to utilize and enjoy your cabin for much more of the year, it could be well worth it.